REAL GROWTH DOES NOT COME EASILY! In channel surfing one evening, we stumbled across Animal Planet’s program “Too Cute, Puppies.” There also is such a program for kittens and likely for other critters, but being the ultimate “dog persons” we focused on the puppies. The program episode follows 3 or 4 breeds of dogs from the birth of a litter through the first 3 or 4 months of life, narrating the various experiences of newborn pups when they open their eyes, try to walk, roll over the step from the house into the yard, experience grass and leaves for the first time, etc. The puppies roll, stumble, trip and fall over each other. They investigate their world and sometimes get stuck, the film capturing their little legs and feet pummeling the air as they try to get back into the house! In short it is an entertaining, but cogent, reminder that real growth is risky. It does not come easily. We know this to be true from our own experiences. For example, I say that I want to be svelte, but those tight muscles and appropriate curves come only after long hours of exercise and disciplined eating, which for me would be a fiery trial to be sure! Riding her tricycle with the wind in her hais is fun on a warm summer day. Children need to run and play to develop strong muscles and bones. Child climbing rope teepee in Texas playground. However, in this day of electronic gadgets to entertain them, it sometimes requires a firm hand to get them outside for proper development and growth. Sometimes the challenge can be a bit daunting, but perseverance will pay of with plenty of fun and a sense of accomplishment. Campground play area in Texas campground. But, even as we stress going outside, we know that such adventure and learning does not come without bumps, bruises and sometimes even broken bones … unpleasant by any definition! Indeed, as adults, we can fall and break bones even when we are not running or jumping … for example, I fell in Alaska when those stairs just popped up out of nowhere! What is true for our physical development is also true for our spiritual development. When we look at our own history, we often can see that real spiritual growth came during dark times and difficulties, not when everything was hunky‐dory. If we are honest with ourselves, we must admit that we learned valuable lessons and we gained insights and blessings even during the difficult times that we endured. Indeed, the fall in Alaska proved enriching to our spiritual lives as we watched, first-hand, the provision that the Lord made and as the Church ministered to us in ways that we cannot begin to explain. In this you rejoice, though now for a little while, if necessary, you have been grieved by various trials, so that the tested genuineness of your faith–more precious than gold that perishes though it is tested by fire–may be found to result in praise and glory and honor at the revelation of Jesus Christ. Count it all joy, my brothers, when you meet trials of various kinds for you know that the testing of your faith produces steadfastness. Our daughter worked at a Christian camp in New Mexico one summer, teaching repelling off mountains. She sent this picture of her “office”. Daughter in her “office” at a camp in New Mexico. She related to me one of the devotional thoughts that she gave her campers after they spent the day above the tree line on the top of the mountain with beautiful views of the surrounding area below. Her thoughts are given here, not verbatim but in general concept. If we stand on top of a mountain, above the tree line, the vista stretches out below us, and it is beautiful. Usually, we remember that “mountain top experience” for a long time. But a careful look around reveals that, actually, there is virtually no significant growth up there. The rarified air might be crisp and clear, but it does not support growth. Looking down toward the valley below, we can see trees, bushes, perhaps a hodgepodge of things, maybe just a blur of green. No matter what we see from the top of the mountain, the truth is that growth occurs in the valley amongst the difficulties and challenges that daily life brings. It is important for us to have a mountain-top experience every once in a while. We need time when we hear the Lord speak to us, when we know His presence in a very real way, and when we can receive energy, direction and new resolve to do His work in our world. But, our Lord does not want us to spend all our time there. How do I know? Because He did not remain on the mountain-top. Remember Jesus’ transfiguration? And after six days Jesus took with him Peter and James and John, and led them up a high mountain by themselves. And he was transfigured before them, and his clothes became radiant, intensely white, as no one on earth could bleach them. And there appeared to them Elijah with Moses, and they were talking with Jesus. Jesus was on the mountaintop with a transfigured visage along with Moses and Elijah. The Law and the Prophets were giving him strength, encouragement, support and resolve to face the persecution, cross, rejection and pain that was fast approaching. His Father again confirmed His love for Jesus. It was a highlight moment for Jesus and for the three disciples who accompanied Him. In fact, Peter wanted to build tents for them at the top of the mountain, thinking that they would be there awhile. Mark 9:5. But, Jesus knew that He had to come down from the mountain so that He could do the work that the Father had entrusted to Him. He had to face the cross and defeat Satan and sin so that those He called to Himself could be cleansed by His righteousness that would cover their sin and filth. Jesus knew that if He was not this sacrifice, His people would have no hope of joining Him with the Father in heaven for eternity. He had a job to do. No tents necessary, Peter, we’re doing back down to the world. That time on the mountain was important for Jesus. The time on the cross was important for us, and Jesus was totally aware of both these realities. I am convinced that no experience the Lord sends or allows in your life is a wasted experience. You may not see the connection between the experience and where you are going, but God does. That class you struggled with in school … may well be the subject that you will use in your ministry years later. That relationship which resulted in rejection and abandonment … may well be the event that will unleash strength in you so that you can undertake ministries that you would never have dreamed of before. If you were privileged to have had a “mountain-top” experience in your life, cherish it and recall it when you encounter difficulties. It is a gift that the Lord gives to you in preparation for what will be coming ahead. But, don’t bemoan the fact that you have to come down from the mountain. Praise the Lord for both the mountain-top experience and for the valley with its difficulties as they strengthen you when you are drawn nearer to the Lord. 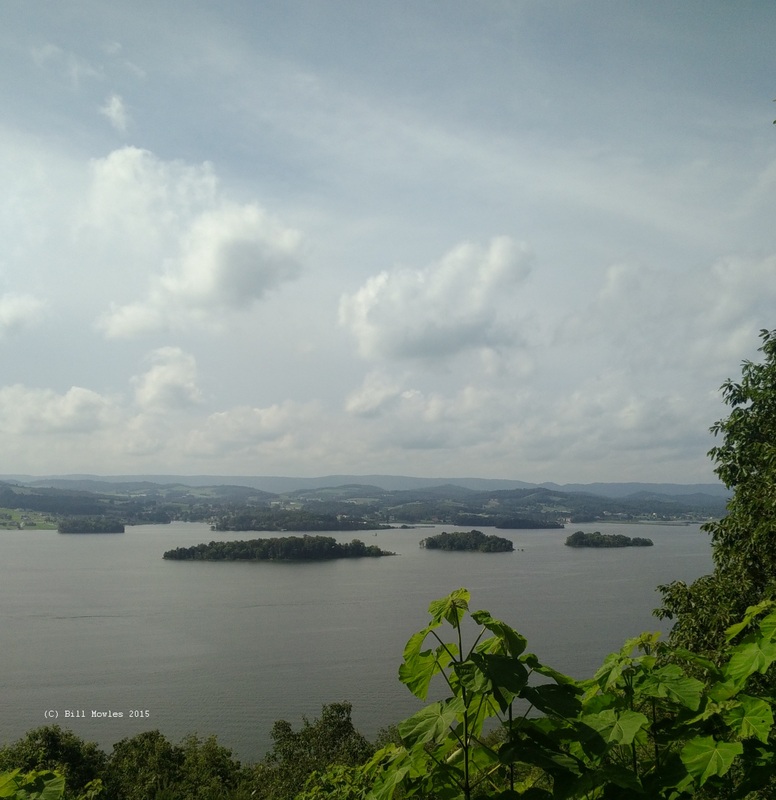 The top of the mountain is pretty – but real growth occurs in the valley! Yosemite National Park Sierra Nevada Mountains, view with valley and lake below. Father, you for those times you granted a “mountain-top” experience. Thank you too for being with me in the valley during the times that I experienced hardship and pain. Even when I cried under the load, you were there aiding and caring for me, with your Spirit interceding when I could not do so. I praise your name, Father. Enable me to love you with my whole heart, mind, soul and strength. 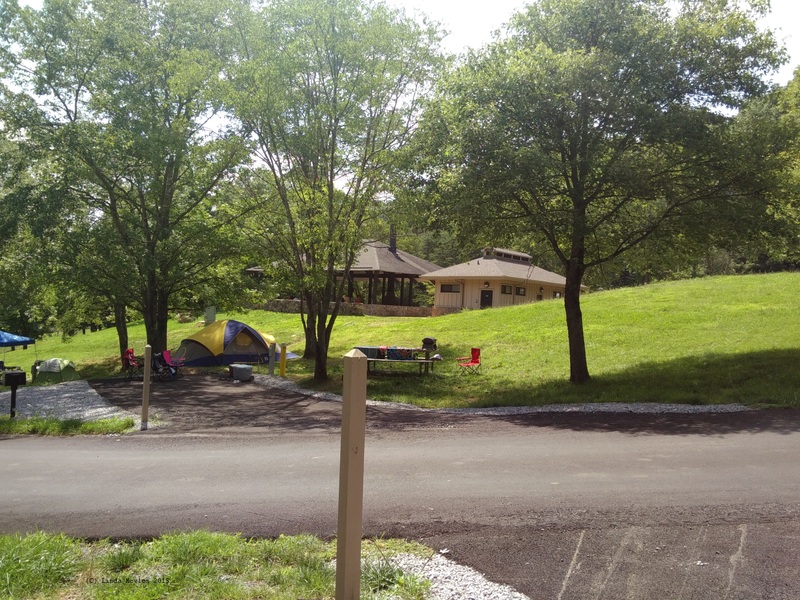 CAMPING AND CICADAS – LIVING SLOW AND LIVING FAST! 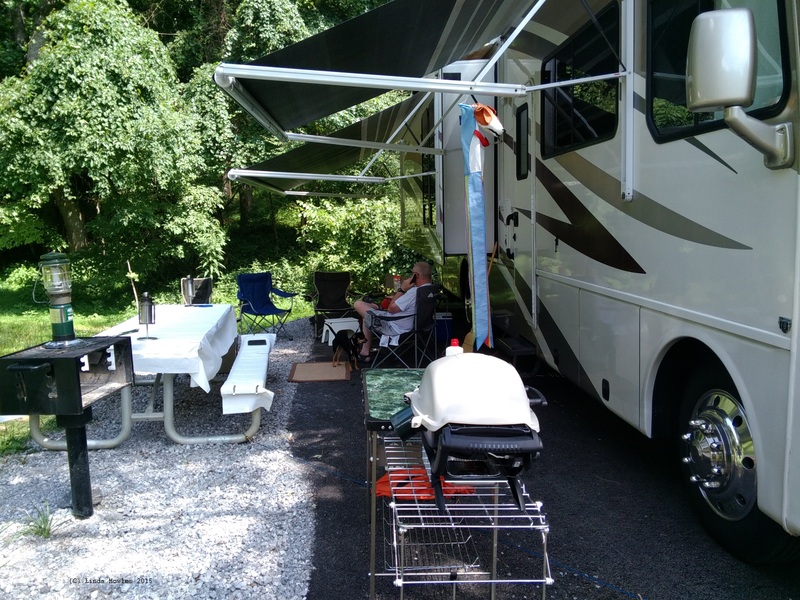 We were camping at the Panther Creek State Park in Morristown, Tennessee recently. It is a beautiful park, with great facilities including a playground, swimming pool, trails, big fields for soccer or just for running, and beautiful overlooks. 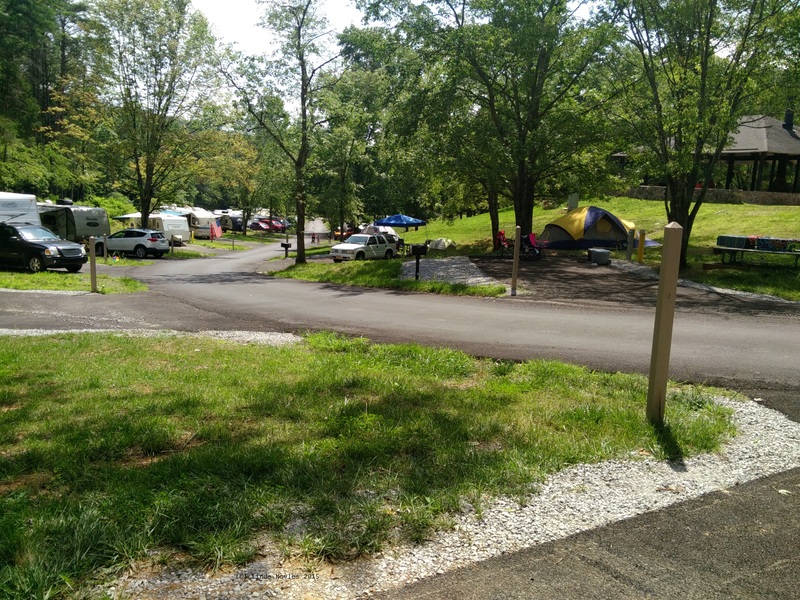 Differing camping styles was on vivid display since there was a tent camping couple immediately next to our RV and a small tent across the street for a family with two children. It was glorious. Time to relax, to read, to just contemplate the glories of our Lord’s creation. When we had the campfire along with the obligatory s’mores, the two girls from across the street joined in, and later their parents came to tell them it was time for bed, and then the girls’ parents sat down and joined our circle of conversation. What a great way to meet people and share our Christian experience, around the campfire! 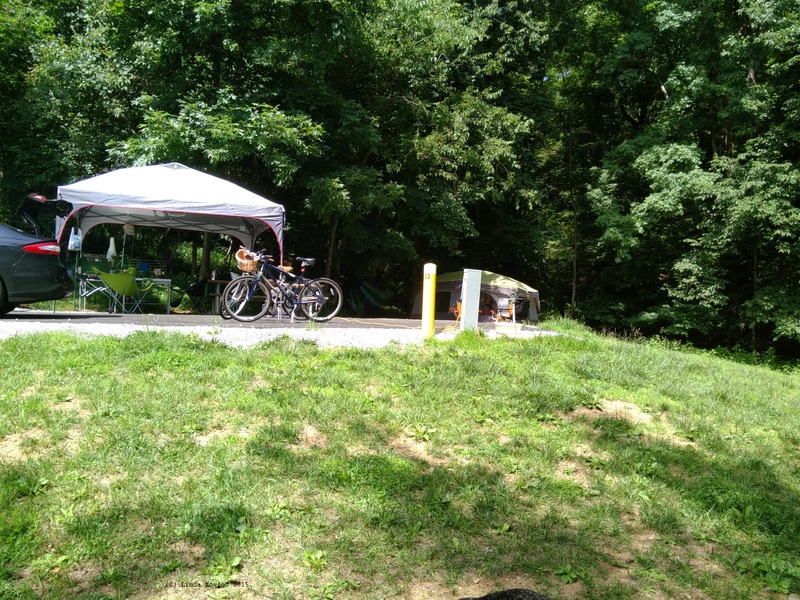 At this campground, the RV backed up to the woods and the fireflies in the evening were myriad. Each evening when dusk descended, the chirping of thousands of cicadas was heard, loud and clear, in a way that is impossible in urban life. We might hear a couple of crickets in the backyard: but in the campground woods, the din from the cicadas was positively deafening. Cicadas. They are an interesting creation of our God and a direct counterpoint to a camping experience – talk about fast living! The 17 year cicada lives underground, around the base of trees in forests and woodland areas, and they dig tunnels in the dirt as their living quarters for 17 years. Then they come out from their underground nursery, after maturing for all those years, by climbing out of “escape chimneys” that they have dug to the surface. When the ground temperature reaches 64 degrees Fahrenheit, they receive a signal. The insects rise up and wriggle out of their burrows to take to the sunlight and fly to freedom, well actually they are not so much looking for freedom as for a mate. Then, after 4 to 6 weeks, during which time the males have mated and the females have laid their eggs underground, they die. Seventeen years later, the ritual occurs again, and the beat goes on. The Preacher in the Book of Ecclesiastes in the Old Testament of the Bible considers life under the sun and calls it “vanity”. R. C. Sproul and other theologians don’t define “vanity” as being vain or of interest in and to oneself, and it certainly is not a table in the boudoir. Rather, Biblical “vanity” is defined as being “futile”. In other words, the Preacher in Ecclesiastes is saying that life is futile – there is no point to it and it just exists and repeats without any ultimate meaning. That certainly seems to be descriptive of the cicada’s life. But, whether or not the cicadas are a 17-year-occurring annoyance or if they have a significant role to play in the ecological foundation of our world, it is certain that our human lives are not meant to be played out in such manner. We are not insignificant insects to God, the Creator of thousands of galaxies. The fact of the matter is that God sent His own Son, Jesus Christ, to this sin-sick world. He died for us to pay the price of our sin. If we believe that he died and rose again from the dead, and if we repent of our sins and claim Him as our Savior, by faith we will be declared to be a Child of God. Do you want meaning for your life? There is no secret or magic pill. To find meaning, just reach out and grab the outstretched nail-pierced hand of Jesus. Fear God and keep his commandments. This is the whole duty of man and woman! This provides life’s meaning. This is fulfilment!